Eric “Outlaw” Hunter has always been like a storm, steadily brewing and constantly threatening to let loose. At a glance you might not see it. He’s a good looking kid, cool with a folksy, high-pitched voice. He smiles often, but that’s just on the outside. Inside, Hunter has been in turmoil for more than ten years. It all began when he lost his chance to go to the Olympics in 2004. After a contested decision, he was named an alternate for the Athens games, but if you ask Hunter it was the first robbery of his troubled career. So instead of going for the Gold, Hunter, then 18, turned pro on January 7, 2005. Ever since that first robbery, it’s been one thing after another. Hunter’s not only been fighting opponents, he’s been battling the system, bad breaks, and as much as anything else, himself, ever since day one. The moment he turned pro, everyone - in Philadelphia and out - was certain that the West Philly “Outlaw” would become a world champion. All he needed was the opportunity. However, despite a solid record, the USBA title, and flashes of brilliance through the years, Hunter’s career was stuck in the mud for most of the last decade. Important wins – Andre Wilson, Jerry Belmontes, and Yenifel Vicente – were followed by self-destructive flameouts or stretches of inactivity. Hunter called it a black cloud, and said he just couldn’t escape it. 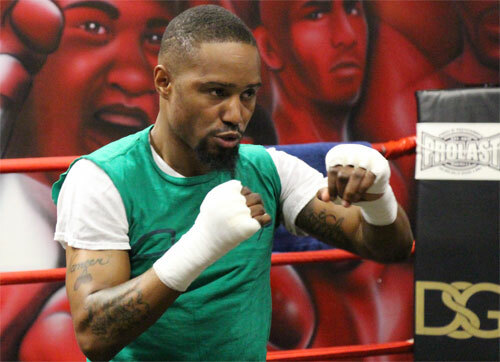 His reputation as the best fighter in Philadelphia persisted, but his lack of career momentum inspired skeptics to hang new tags on the frustrated fighter. Behind his back, whispers of “underachiever”, “self-destructive” and “head case” began to follow the once “can’t miss” prospect. Managers, promoters and advisors came and went. Golden opportunities fell to the wayside, but Hunter just kept his head down and all the while, let his anger brew. Despite unquestionable talent, it appeared the chances of him reaching his potential kept slipping further and further away. 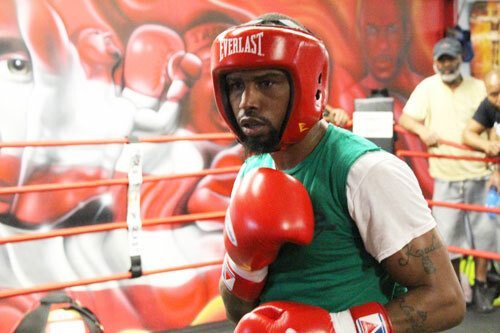 Many stopped believing in him, and the haters said he was just another Philadelphia fighter who was going nowhere. Then suddenly the opportunity he’d waited so long, finally arrived, seemingly out of nowhere. On Saturday (April 9th), Eric Hunter, 21-3, 11 KOs, meets IBF featherweight world champion Lee Selby, 22-1, 8 KOs, at London’s O2 Arena. Twelve rounds for the world title and Hunter’s total salvation. Showtime will broadcast this critical moment of truth beginning at 5 PM Eastern time. Many question whether Hunter can make good with his big opportunity. It seems people have been doubting him for so long, they can’t break the habit. In Philadelphia, haters abound. Failure runs deep in Philly. It’s as if it has tainted the water supply. Many of those who’ve already failed are always ready to recruit new members for the club. “He’ll never get on that plane,” one local boxing insider told me about Hunter’s upcoming trip to London for the biggest fight of his life. “He’ll find a way to screw it up,” another doubter pronounced with certainty. Hunter has heard it – or felt it - all. He knows there are just as many people rooting against him as there are rooting for him. “They” is a big word in the Hunter vocabulary. He’s always talking about “they”. He’s made a lot of enemies during his career – real and imagined – and he knows many want him to fail. But with every slight, his only action has been to let that storm inside him gather force. At face value, it’s hard not to favor Hunter over Selby. At the very least, he’s got an excellent chance. Hunter is a better boxer than Selby and he’s the harder puncher. He’s still just 29 years old, loaded with ability and hungrier than any fighter on the planet. Hunter knows that this is his one shot at making it, his one chance to show the world. April 9th means everything to him. In fact, the date with Selby is far more than just a title fight. It is an opportunity for Hunter to soothe that rage inside him. Only boxing offers him a chance to do that, and Hunter is looking to resolve a lifetime of turmoil in this one fight. It makes sense that Hunter only feels emotion while at work. Boxing is who he is and where he feels authentic. Outside he kept his armor up. He had to be hard and he had to be tough. He didn’t have the luxury of dreaming. However, inside the gym, any gym, and in any ring, he could dream of a better life. As he talked, you could feel all that poison festering inside him. The world is an unfair place, and boxing is his only way of coping with it. In boxing, he can believe he is something special, something of value. Nothing else has ever given him that sense of hope. While Hunter trained on this day, it was evident that the gym was his home. 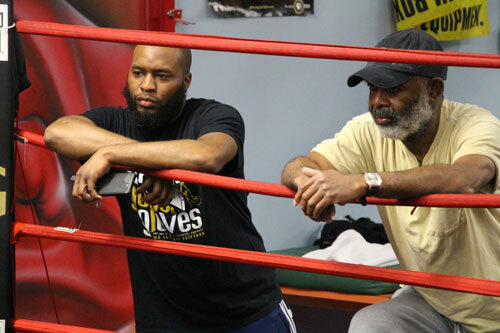 In addition to his team, trainers Hazma Muhammad, Sloan Harrison and a few others, his family was right there with him. 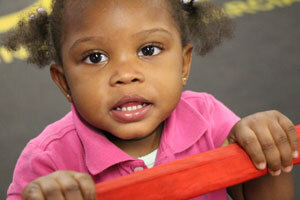 Hunter’s youngest daughter toddled around the gym, her mother chasing her the entire time. 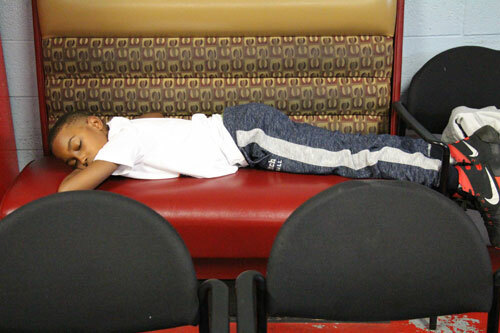 A few yards away, Hunter’s oldest child, his son Kadeen, slept solidly on a padded bench, oblivious to the growing importance of the moment and all the emotion his father was feeling. Hopefully Hunter can convert this emotion into the fuel he needs to transform his life. If he can win this one, everything changes for him. But he agrees that this fight is more than just a fight. That’s a lot of pressure to take into a prizefight. Hunter is infamous for rollercoaster emotions that have often boiled over and hurt him, in and out of the ring. However, Hunter says he knows how to keep it all in perspective. Despite being in the sport for so long, Hunter is still looking to gain some real attention for the first time. In Selby, Hunter will encounter a proud champion fighting with his home nation rooting him on from ringside. When a fighter goes abroad to challenge for a championship, it’s always a concern. Bad decisions, favoritism and downright abuse often await the visitor. A knockout certainly would send the message Hunter wants to send to the boxing world, and would also help him to avoid any overseas funny business. He’s certainly working hard for it. At the gym, Hunter has been flooring it ever since the first hint of this fight began to surface. The IBF installed Hunter as the mandatory challenger for Selby, after Hunter’s promoter, Greg Cohen, worked behind the scenes to secure that slot for the Philadelphian. The opportunity has Hunter motivated like never before. 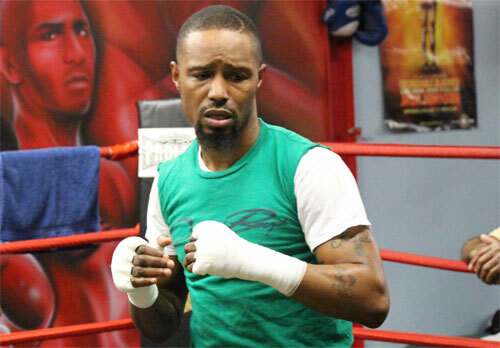 If Hunter can beat Selby, his name will be added to the exclusive list of Philly fighters who became world champion. Like the label or not, Hunter is poised to join just 30 other Philly fighters who have won world championships. 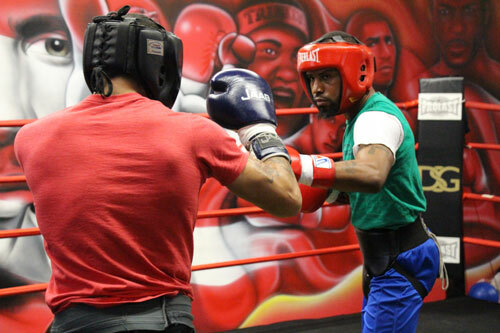 For Hunter’s legacy, becoming a world champ would be the difference between him being remembered as a legend rather than just a good pro – Philly fighter or not. Champions have a shortcut to the most memorable pages of folklore. Hunter still has plenty of people in his corner, but does that even matter to someone who has subsisted so long on anger, hurt and solitude? Perhaps the possibility of happiness and success is the scariest thing out there for a guy like Outlaw. It seems that if he has nothing to rage against, he’s lost. He’s already begun pushing away potential well-wishers and the many fans who he believes don’t truly have his back. But will that calm the storm? Hunter thrives on turmoil. He finds it around every corner and he finds it within every fan. He’s only at peace inside the ring engaged in the only type of conflict he’s comfortable with. He’ll find some peace on Saturday in London, maybe twelve rounds worth. But when Hunter finally unleashes the storm that is very likely to bring him everything he’s ever fought for, will it be enough to find him peace in the world among the happy? Knowing Hunter, that seems unlikely. For him, another storm will always be brewing on the horizon.